…when I was a kid, I was one of those kids who thought and felt bad luck just followed me around. I was the “unluckiest” person in the world, the world was always against me. One time while car pooling to University, a shortcut route we took required the passenger (on that day it was me) to get out of the car and press the pedestrian crossing button to stop traffic and allow us to make a turn. On that day it was a cloudy day but no sign of rain or anything like that. The moment I got out, it started to hail. It rarely if ever hails in that part of Canada. I ran out pressed the button and quickly ran back into the car. Once I closed the door, the hail stopped. Sounds like a made up story? My friend who was driving just looked at me with a “WTF” look on his face, just as I had. If it weren’t for the fact he saw what happened too, this whole story sounds made up. But once I learned that my life was a product of my OWN doing, things started turning around. 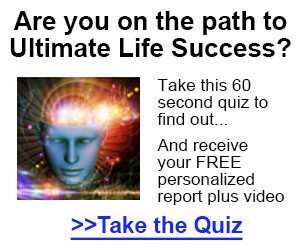 And if you want a personalised report for what you need to do to turn your life around and succeed at life, get your own personalized Life Success report here.